If you are on the lookout for outstanding comfort and vision quality, then the Proclear 1 Day 30 pack is for you. Dryness and discomfort are common complaints with most contacts wearers, especially those who spend hours in front of a computer. Proclear 1 Day 30 pack provides a great solution to all these issues. 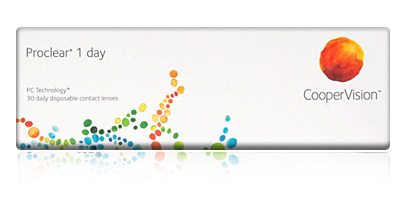 In addition to the convenience of daily disposables, you will get unsurpassed comfort with these CooperVision lenses. Normal disposables are fresh in the morning, but may feel uncomfortable by the end of the day. The Proclear 1 Day 30 pack lenses stay fresh from morning until the end of the day. 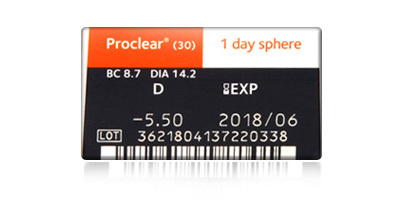 PC (phosphorylcholine) technology is used in the manufacture of Proclear 1 Day lenses. The phosphorylcholine molecules have high water retaining capacity and they are natural elements found in the cell membranes of humans. For over 12 hours, these molecules keep the Proclear 1 Day lenses comfortable and moist. 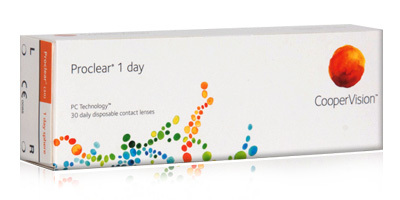 We are a trusted supplier of Proclear 1 Day 30 pack contact lenses. Our service is exceptional and prices are competitive. All our contact lens products are sourced directly from UK manufacturers.